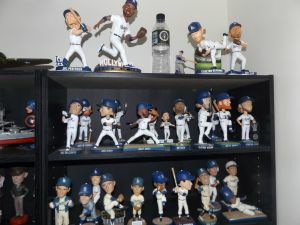 Bobbleheads have become a hot item in Dodger land over the past several seasons. They’ve caught fire across all sports actually, but nowhere more than Dodger Stadium. The Dodgers now regularly feature ten or more bobblehead nights at Chavez Ravine per season. Every important Dodger throughout the years has had their likeness molded into a bobble. That’s how any player knows they’ve finally made it big time, they get their own bobblehead. (UPDATE) Contest is now closed. Random drawing came up with the number 6….So that means….CONGRATULATIONS TO BLUEFAN! HE IS THE WINNER. He chose 2, and he was the closest without going over. Sorry Jay, you were close. Bluefan I’ll be in touch with you soon and get your info so you can collect your bobblehead. If for some reason Bluefan doesn’t respond then the next closest guesser, which would be Jay would win. Thanks for playing everyone! There are many different types of bobbles. Dodger bobbles aren’t the only kind. They have bobbles of other teams, other sports figures, pop culture icons, movie characters, cartoon characters, comic book characters and so on. Absolutely anyone or anything can have a bobble. That’s where the company called Foco comes in. Foco is a company that designs and makes custom Bobbles amongst selling other sports apparel and collectibles. They make all kinds of bobbles and they are without a doubt works of art. They have quite a few Dodger bobbles as well. For instance Clayton Kershaw, Yasiel Puig, Manny Machado and others all have their mugs emblazoned on a bobble. Check out some of the Dodger bobbles on Foco’s online store. I have good news. LADR and Foco are joining forces to offer you a bobble giveaway. The rules are simple. All you have to do to enter is comment below with a number between 1-99. I’ll be doing a random drawing after one week and whoever gets closest to the number without going over wins the prize. So what is the prize? The giveaway prize is a Foco custom designed Clayton Kershaw bobble with claw spinner. Take a look at this thing. It’s so beautiful it almost makes me want to cry. The bobble is larger than most bobbles, but not too large where it takes up your entire mantle space. The craftsmanship is incredibly detailed, right down to the Kershaw facial hair and scowl. The flaming arm is a nice tough and you can see the Dodger Stadium video board behind him. It’s not your typical bobble. This one has teeth. That’s what most of the Foco custom designed bobbles look like. They’re simply put works of art. You’ll also be getting a cool metallic Dodger claw metal spinner. It spins like Kershaw’s curveball. Be careful though because that thing gets addicting. You may spend hours watching it spin. I took the time to sit down virtually with a couple of Foco’s key guys (senior licensing manager Matt Katz and marketing coordinator Anthony Davino to ask them some questions about the company and products. Check out their answers below. Also check out Foco’s website here, and online store here. Make sure to follow them on twitter here as well. Don’t forget to comment below with a number between 1-99 to win your free custom Clayton Kershaw bobble! How did Foco begin? Tell me about the beginnings of Foco and how the first bobbles were born? FOCO started as Team Beans, LLC making plush bears with team logos. It was first licensed by the MLBPA and MLB. After a successful run of sales with the plush bears the company took a look at other trending products and bobbleheads has just started making a comeback in the early 2000s. We approached the leagues to expand our license and were granted rights. The first bobblehead the company made was a Woody Hayes bobbles for the Ohio State University. What was the first Dodger bobble to be featured on Foco? 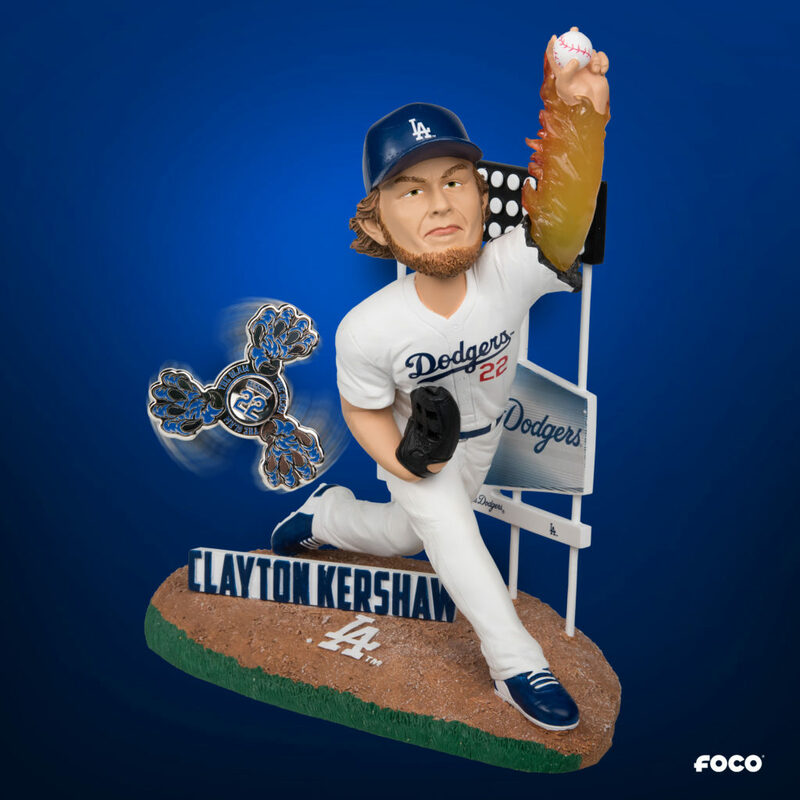 The first Dodger bobblehead to be featured on FOCO was the Kershaw “Fire” Arm with exclusive spinner in the summer of 2017. 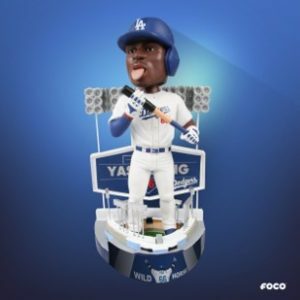 The second Dodger bobblhead that launched on the new FOCO.com was the Yasiel Puig “Bat Lick” bobble. I would say my favorite bobblehead here at FOCO, is our Batman/ Bane entertainment bobble. It is an exclusive we had at New York City Comic Con, and it is a large piece, in which the bobble is in the back of batman. So it actually bobbles where Bane is breaking Batman’s back, https://www.foco.com/products/batman-knightfall-nycc-2018-exclusive-bobblehead. Where do you see Foco going in the future? Will Foco branch out into any other sector of collectibles? FOCO will continue to offer fun, unique, exclusive products. The goal is to try and capitalize on interesting moments and “hot markets” and hopefully be able to support all major markets with fresh ideas all season long. prior to my hiring at FOCO, I was working with the New York Mets. I had an amazing experience with the Mets, met a lot of great connections, learned from some great leadership, and overall had a great time calling Citi Field my second home. Also, friends and family are Mets fans, so I would say I am a Mets fan. The Kershaw Bobblehead you can get during the regular season is awsome, the Kershaw Bobblehead that you can get during the post-season ain’t so great. Been collecting them for a while now…I have some I really like. The older ones are too cartoonish. You can look at the original Newcombe and the one they gave out a couple of years ago and the face is totally different. Same with Big D, who had his own bobble back when they looked more like cartoon characters, and is featured on one with Maury Wills. They need to make a new one of him. 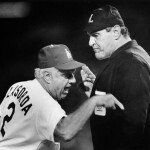 I have 3 Koufax’s. I was disappointed this year when they cancelled putting out the Gilliam and made 3 that were not originally on the schedule, Utley, Machado, and Kemp. 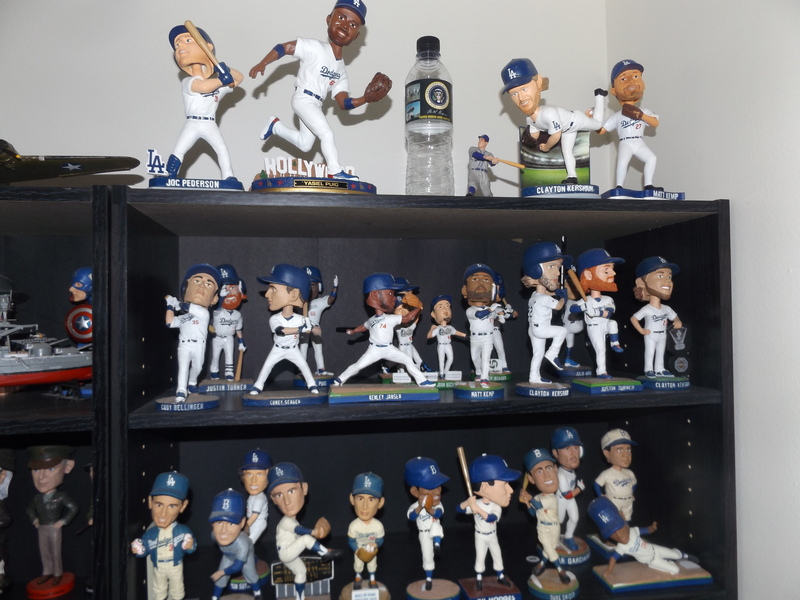 In the picture above the top shelf is Pederson, Puig, a water bottle from the Reagan Presidential Museum, a small Duke Snider figure, Kershaw, and Kemp, All of those are what they call Stadium Bobbles because they are only available at Dodger Stadium gift shops. The next tier is players who are on the team now like Cody, Corey, Justin and Kenley, and the row below that is Dodger legends, Koufax, Snider, Lasorda, Hodges, and a Babe Ruth is there too. I also collect historical and presidential bobbleheads that you can get on Amazon. They are made by a company called Royal Bobbles…….HAPPY THANKSGIVING TO ALL! HAPPY THANKSGIVING TO ALL here, and to all who may not be here. Happy Thanksgiving Paul, and happy Thanksgiving to all of LADR! Happy Thanksgiving to all and to you especially Paul and your little bird friend. He is almost like a Dodger mascot. Miss hearing about him. Lol who here is from mlb.com? I don’t think anyone here is from mlb.com. why? I grew up near there. 7, and thanks for the opportunity! As a looong time Dodger fan living on the east coast I only rarely get to see them play live anymore, and have to suffer with them vicariously through the blogs.